Photos by Cheryl Wertman – Lyndonville’s Evan Horn grabs a rebound from the Wheatland-Chili duo of Brian Napier and Aaron Lund during the host Tigers division title clinching victory this evening. 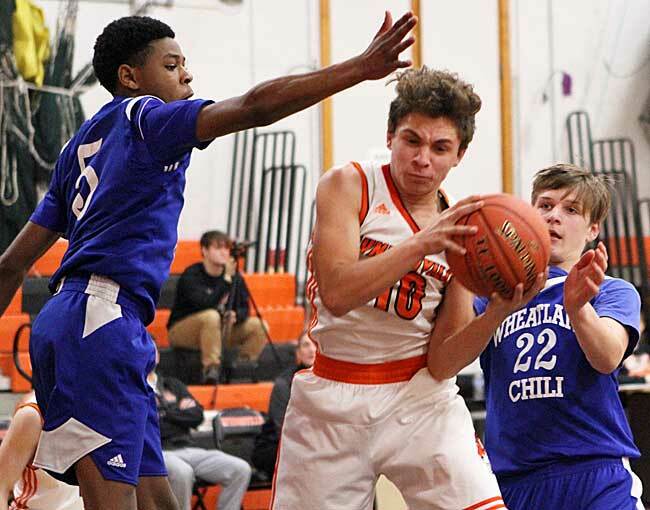 Leading from wire-to-wire, Lyndonville romped to a 60-37 victory over visiting Wheatland-Chili this evening to lock up the Genesee Region League Division 2 boys basketball championship. 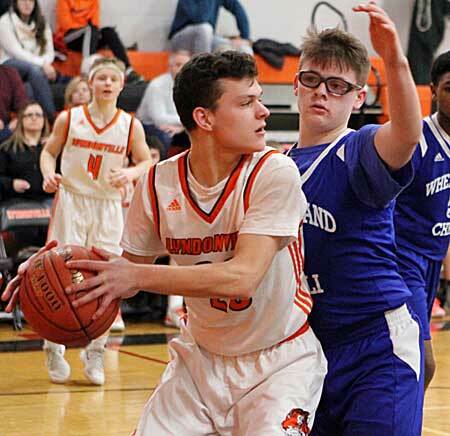 Zach Johnson and Nathan Hydock both scored 14 points to lead the way for Lyndonville which improves to 11-2 in the league (6-1 in Division 2 and 16-2 overall). Lyndonville’s Nathan Neace looks to pass as Jordan Richards defends for W-C. The Tigers also had Nathan Dillenbeck with 9, Matt Hess and Russell Stephens 6, Nathan Poler and Evan Horn 4 and Casey Winiecki 3. Jose Rivera scored 14 and Jordan Richars 10 for Wheatland-Chili which slips to 0-19. Lyndonville led 12-6 after the opening period as Hydock had a three-point play and a layup and Dillenbeck a layup off a turnover to spark the Tigers in the early going. The Tigers then broke the game open with a big 18-4 second period scoring surge to open up a 22 point, 30-8, lead at the half. Johnson led a parade of six scorers for the Tigers in the period with 6 points. The Tigers upped the advantage to 30, 42-12, midway through the third period and held a 26 point, 47-21, lead at the three-quarter mark. Lyndonville will close out the G-R campaign by hosting Kendall at 7 p.m. Monday. In a G-R girls contest, Elba defeated Kendall 76-36. 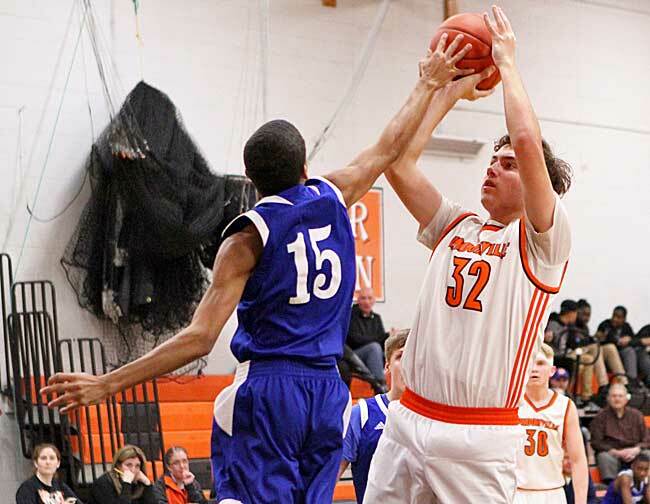 Devin Rounds puts up a shot for Lyndonville over W-C defender Desmond Walker.